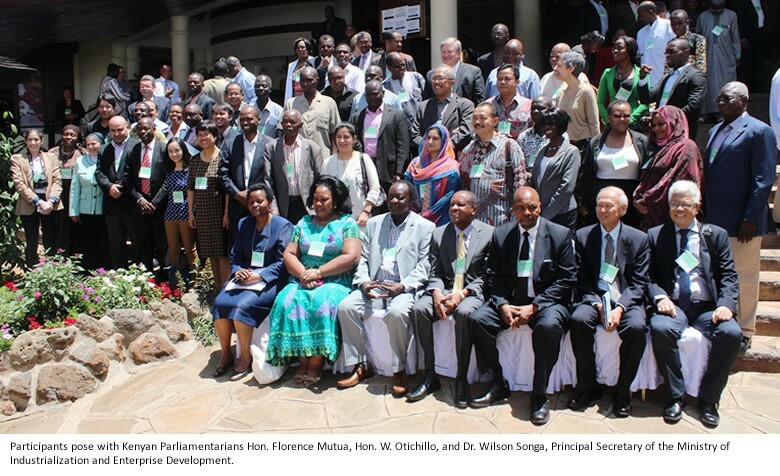 Delegates from 30 countries from around the world, attending an international Agri-biotechnology and Biosafety Communication (ABBC 2015) conference in Nairobi have called on the Government of Kenya to lift a 2-year ban on GMO imports. Addressing the delegates who comprised farmers, scientists, policymakers, private sector, the media and science communicators, the Principal Secretary in Kenya’s Ministry of Industrialization and Enterprise Development, Dr Wilson Songa, emphasized the role of agricultural biotechnology in propelling the country towards prosperity. “To harness this potential, the GMO import ban must be lifted,” he said. In addition, he said that Kenya has adequate capacity to develop and ensure safety of GMO products. Members of Parliament present called upon the government to release the report by the Ministry of Health task force that was set up to look into the safety of GM foods, following the ban on GMO imports. The ABBC conference brought together organizations and networks involved in agri-biotechnology and biosafety communication around the world to take stock of the progress and dynamics of agri-biotechnology communication over the past two decades. It was organized by the International Service for the Acquisition of Agri-biotech Applications (ISAAA) AfriCenter, the African Agricultural Technology Foundation, the National Commission for Science Technology and Innovation among other partners. One of the key lessons was that agri-biotechnology and biosafety communications must be simplified and messages delivered in appropriate languages for different stakeholders to make impact. To work collectively to improve the communications environment, including the use of the latest as well as traditional communication strategies to ensure effectiveness. To work inclusively, with all stakeholders, including those opposed to this technology, in an effort to build consensus and common understanding. To promote choice, so that farmers, consumers and other end-users can make informed decisions that reflect their best interests. To address the concerns of people at all levels, to ensure the widest participation possible. To demonstrate how agricultural production challenges can be tackled using biotechnology, and how it can directly contribute to food and nutrition security, poverty alleviation, job creation and sustainable economic development. To support credible scientists who are most trusted by the public and governments to be effective communicators and to have a closer relationship with the media and policymakers to ensure that scientifically-informed messages reach target audiences. In particular, we gratefully acknowledge the active participation of Members of the Kenya National Assembly and many senior government representatives who participated in this conference and welcome their invaluable inputs to ensure the current ban on importation and consumption of GM foods in Kenya is lifted. Kenya’s National Commission for Science, Technology and Innovation (NACOSTI) and the Ministry of Education, Science and Technology have issued a call for abstracts for the fourth National Science Week to be held on 11-15 May 2015 in Nairobi. The event consists of an exhibition, robotics contest and a conference. The aim of the conference is to share and identify practical, evidence-based solutions to science and technology development in the post-2015 agenda in line with Kenya’s Vision 2030 national strategic development plan. The conference will bring together academia, researchers, scientists and practitioners working in universities, research organisations, industry, civil society, government and other stakeholders. Visit the Ministry of Education, Science and Technology website for more information on how to submit abstracts. The deadline for submission is 31 March 2015. The work of agricultural researchers and development workers in Africa has the potential to significantly improve the lives of the poor. But that potential can only be realized with easy access to high-quality data and information. The Atlas of African Agriculture Research & Development highlights the ubiquitous role of smallholder agriculture in Africa; the many factors shaping the location, nature, and performance of agricultural enterprises; and the strong interdependencies among farming, natural-resource stocks and flows, and the well-being of the poor. What about the underlying data? The atlas is part of a wide-ranging eAtlas initiative that will showcase, through print and online resources, a variety of spatial data and tools generated and maintained by a community of research scientists, development analysts, and practitioners working in and for Africa. The initiative will serve as a guide, with references and links to online resources to introduce readers to a wealth of data that can inform efforts to improve the livelihoods of Africa’s rural poor. Sharifa Juma digs terraces to stop soil erosion in Lushoto, Tanzania. Photo credit: Georgina Smith / CIAT. Greetings and a very Happy New Year 2015! As we begin yet another new year, we say goodbye to 2014, the International Year of Family Farming, and usher in 2015, the International Year of Soils. 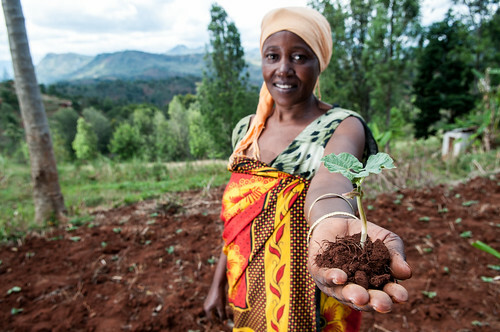 The 68th United Nations General Assembly declared 2015 the International Year of Soils. The Food and Agriculture Organization of the United Nations (FAO) has been nominated to implement the International Year of Soils within the framework of the Global Soil Partnership and in collaboration with governments and the secretariat of the United Nations Convention to Combat Desertification. The International Year of Soils aims to increase awareness and understanding of the importance of soil for food security and essential ecosystem functions. Visit the 2015 International Year of Soils website to find out more. Agricultural biotechnology has been used to address constraints in agriculture and has the potential to make a major contribution to the overall goal of sustainable intensification. The adoption of agricultural biotechnology, and specifically genetically modified (GM) crops, by many African countries has been quite limited to date, however. To further inform the debate over agricultural biotechnology, a report by the International Food Policy Research Institute (IFPRI) and the African Development Bank collects current information on the status of biotechnology in Africa—with an emphasis on GM crops—and assesses the opportunities offered by and constraints on adoption. The authors provide information about the region’s limited financial, technical, regulatory, and legal capacities while additionally focusing on the role of trade concerns and conflicting information as limiting factors that affect adoption. The authors also identify several initiatives that could help overcome these obstacles, such as increasing public investments in agricultural biotechnology research and development; improving regulatory frameworks and regulatory capacity; and developing an effective and broad-based communications strategy. These and other recommendations should be useful to policymakers, development specialists, and others who are concerned about the potential role that biotechnology could play in Africa as an additional tool for sustainable agriculture development. 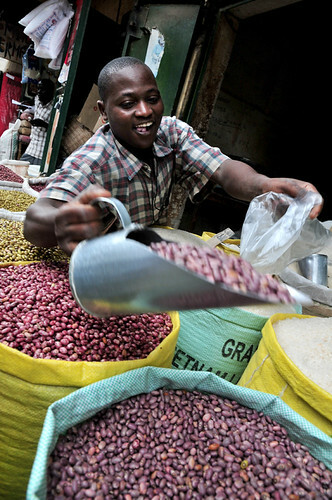 A man sells beans in a market in Kampala, Uganda. The African Union has nominated 2014 as The Year of Agriculture and Food Security. Photo by Neil Palmer (CIAT). Happy New Year! It’s now just about one week into the New Year 2014 and I trust that you have gotten off to a good start this year. The African Union (AU) has nominated 2014 as The Year of Agriculture and Food Security. This is also the theme of the 22nd AU summit which is scheduled to be held on 21-31 January 2014 in Addis Ababa, Ethiopia. The summit also marks the completion of a decade since the Maputo Declaration on Agriculture and Food Security that gave rise to the Comprehensive Africa Agriculture Development Programme (CAADP). Under this declaration, AU member states committed to allocating at least 10 per cent of their national budgets to agriculture within five years. I think the 22nd AU summit will be a useful forum for member states to take stock of their performance vis-à-vis the Maputo Declaration target and against that of their peers. Meanwhile, I hope to keep blogging about various developments in agricultural research and development in Africa in 2014. As always, your comments and feedback are most welcome.